Abbey Well was one of the first brands of bottled water to be sold in the UK, but you will not find it in supermarkets. It is sold only to the premium sector and as it continues to expand its market presence, it has chosen premium-rate equipment for its new filling line. The space beneath the filler is an interesting one. Most manufacturers use it as a convenient area to place the drive motors and gearing, but on the Metalnova Rinser-Filler-Capper Baseless VMAG Monoblock there is a gaping space. Enterprise Tondelli who supplied the machine and Abbey Well who now use it are all convinced that leaving this area empty is a far better approach. Releasing the motors from the confines of the lower cabinet and placing them on top of the filler has other advantages. The gear boxes and drive shafts can be eliminated and replaced by larger gear wheels which Enterprise Tondelli says causes less wear and tear. This inevitably reduces maintenance and downtime which in turn lowers costs. The filling zone is worthy of special attention. There is no in-feed wormscrew, instead a starwheel pitches the bottles by their necks with a clean and positive movement. If there should be any reason to remove a bottle, there is a simple release mechanism which makes the task childs-play; and, of course, there is ample space inside the cabinet to work should the need arise. 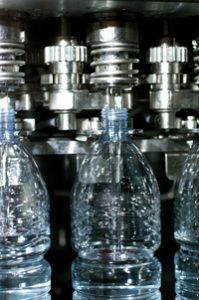 Once positioned beneath the filling head, the bottles are lined-up with the nozzles, but physically separated from them in a design which prevents any contact between the nozzles and the necks of the bottles. Integrity of the product is maintained by the usual method of sterile air filtration. Every valve on the filling head has its own magnetic flow meter which calculates the passage of the product passing through it. This is automatically recalibrated on each fill to +/- 0.2 percent, offering one of the most accurate fill-levels in the industry. The monitoring system checks each head as it performs every fill cycle and downloads the data to a computer, allowing irregularities to be easily detected and providing the operator with advanced warning of potential wear. Similarly, the rinse nozzles are each controlled by individual solenoid valves guaranteeing a consistent rinse time. These savings manifest themselves in many ways. Downtime, for example, is a major issue that fillers consider with every component on a line. In the case of Abbey Well this is of added importance because of their range of products and the way that they have evolved. This is worth looking at in order to understand how the company fits into the market and what it requires from its equipment. With regular product changes, another concern can be the carry-over of flavours which can be absorbed into the seals or behind them. The fact that there is no contact between the nozzle and the neck of the bottle on this machine undoubtedly helps, but Metalnova has gone much further in addressing this issue. The design of the filling nozzles relies on only two seals – one of pharmaceutical grade and the other a flat rubber seal – instead of the more common multiple seal design. This not only aids maintenance, but also offers less opportunity for carry-over and makes cleaning easier. It is easy to see that this machine is a used for filling. What is not so easy is to work out where everything is. With the motors placed above the filling stations, the header tank has to be displaced. Where is it? Well, it does not exist anymore in this design. The tank, which is used traditionally used as a mechanism to keep the product flowing by gravity to the filling stations, has been removed. Instead, the filling valves on this machine are fed from a central manifold. This design, not only simplifies cleaning, but also reduces the amount of product that is wasted when the system is flushed. CIP is automatic and does not require physical intervention by the operator. This significantly cuts down on cleaning time and eliminates human error in an environment that demands high standards of hygiene. Metalnova founded in 1981 and still under the same name which is something of a rarity now days with the changing market, manufacture the full range of range of fillers including counter pressure, gravity fillers for still products, low vacuum assisted gravity fillers for wines, spirits and liquors, vacuum fillers with recirculation for hot filling and/or high density products, low pressure controlled fillers for oil and electronic volumetric fillers for carbonated and non carbonated products. Filler speeds range up to 60,000 bottles per hour and with up to 140 valves for the Metalnova machines. 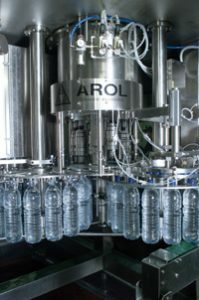 One of the very first fillers built by Metalnova was sold by Enterprise Tondelli in the Middle East for filling cordial drinks. This machine is still in operation after 23 years and running very reliably and in excess of the original contract output. 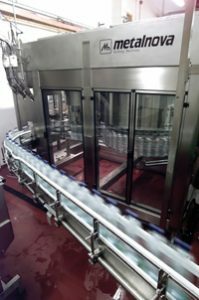 Enterprise Tondelli who have been supplying from single machines to complete turn key projects for over 28 years to the beverage industry. These have included complete lines with filling machine monobloc rinser/filler/cappers with a few as 16 valves up to 140 valves and all sizes in between. Enterprise Tondelli have their head office in the heart of the beverage manufacturing region in Parma, Italy. A branch office located in the UK follows the International market.